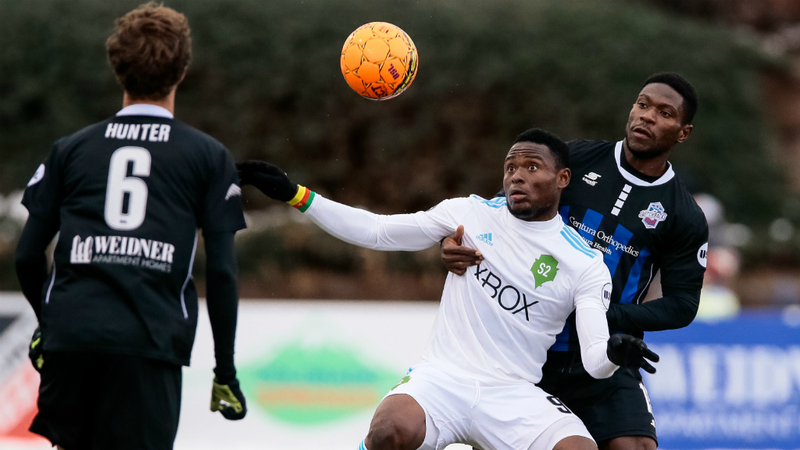 COLORADO SPRINGS, Colo. – Colorado Springs Switchbacks FC and Seattle Sounders FC 2 had numerous goal-scoring opportunities but couldn’t find the breakthrough, as they finished 0-0 at Weidner Field on Saturday evening. Both goalkeepers – Seattle’s Calle Brown and Colorado Springs’ Moise Pouaty – turned in notable performances to record shutouts. Brown recorded multiple jaw-dropping saves on the night, most notably denying Jordan Burt with a diving effort in the 26th minute. Not to be outdone, though, Pouaty came up big for the home side in the second half, making a sleek stop to deny David Olsen's low shot in the 72nd minute. With the result Switchbacks FC moves to 3-4-1 on the year, while S2 is now 2-4-1. 1. Seattle's Calle Brown had arguably his best performance of the 2018 USL regular season, making key saves to record his first shutout of the campaign. In the end, Brown finished with three saves, but two in particular stood out. While his acrobatic denial of Jordan Burt in the 26th minute had Switchbacks fans pulling their hair out, Brown’s 79th-minute stop was maybe even more impressive. The Switchbacks’ AJ Ajeakwa was through on goal, but Brown came off his line quickly to cut off the angle was able to react swiftly to push Ajeakwa’s shot over the crossbar to preserve the tie. 2. Both sides were reduced to ten men around the hour-mark as S2’s Ray Saari received his second yellow and a subsequent red card in the 59th minute, and Colorado Springs’ Luke Vercollone was shown his second yellow of the match and marching orders in the 62nd minute. Both Saari and Vercollone will be missed by their respective sides in their upcoming fixtures, as the former serves as the captain for S2 and the latter is a veteran and key contributor for the Switchbacks. 3. The Switchbacks have been shut out five times this campaign. Colorado Springs just missed out on the USL Cup Playoffs as season ago – finished two points behind Sacramento Republic FC, which was the eighth and final team that qualified for the postseason – so the team must get better production as the season moves along if it wants to avoid what occurred in 2017. S2, meanwhile, is now on a two-game unbeaten run after recording a 3-2 victory against Rio Grande Valley FC on April 14, and the team will happy to return home for matches on May 6 and May 12. Calle Brown, Seattle Sounders FC 2 – The netminder recorded three saves, including two jaw-dropping stops, to earn his first shutout of the season for S2.